The entrepreneurial world may initially seem like a foreign land for a healthcare student but for one Edinburgh Napier Masters student, the two are much closer to each other than you may think. Godwin Mark is currently pursuing an MSc in Healthcare Management at Edinburgh Napier. Designed for graduates who aspire to a management role in health and social care, the programme is unique in that it offers modules from both the University’s Business School and School of Health and Social Care. 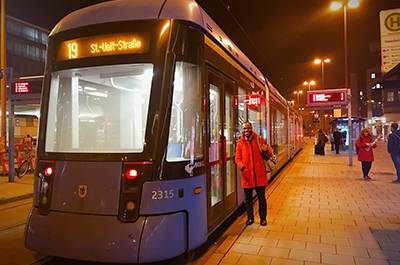 Recently, the Nigerian student was given an insight into the entrepreneurial possibilities within the healthcare industry after he attended a unique boot camp programme at the Strascheg Centre for Entrepreneurship within the University of Applied Sciences in Munich. The 30-year-old was given the opportunity to attend the week-long programme by Bright Red Triangle, the University’s one-stop shop for extra-curricular innovation and enterprise activities. 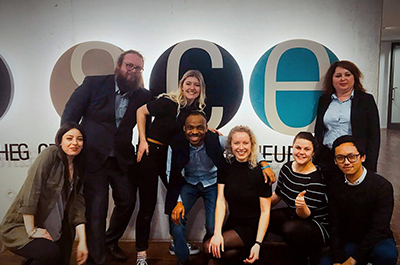 Joining around 50 other young, innovative and business-minded scholars from universities across Europe, the programme aimed to equip participants with practical skills and knowledge in start-up thinking. From teamwork, value proposition and business design, to understanding venture capital, business ideation and pitching, attendees got to work with a number of business experts throughout the week-long stay. Working in teams, participants also had to complete a range of daily tasks including speaking to people such as storeowners, sales reps and customers about what they look for in a specific product. 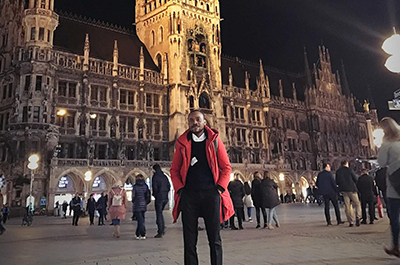 For Godwin, his week in Munich has opened his eyes to the entrepreneurial opportunities there are within the healthcare world. He said: “I found the programme very beneficial. I now appreciate the importance of transferring design thinking to healthcare where care ought to be patient-centric and user-targeted rather than a top-down approach. General principles of medicine and care still need to be considered but the users’ needs is paramount. “I’m grateful for the opportunity given to me by Bright Red Triangle, even though I wasn’t coming from a business background. I could not have experienced the programme without its support, through selecting me to take part and the guidance they gave me on attaining my Visa for the week.